The goal of sustainable planning, policies, and governance is to design processes that return our planet to a more balanced level of use. To do so we must realign our values and earth’s ability to support them. The success of this effort is dependent upon a foundation of science, a means of collaboration, and the implementation of sustainable polices and administration. GIS is an essential tool for designing and implementing sustainable processes at a scale ranging from local to global. People around the world continue to compile scientific data about resources, ecosystems, and human impact. GIS enables us to visualize and analyze these massive collections of data. Establishing a base for determining cause and effect, GIS tracks ecological change and provides chains of evidence of human impact. It tracks people’s land use, methods of resource extraction, and peripheral activities, such as supporting road networks. GIS manages large databases, depicts and prioritizes problems, models scenarios of both positive and negative practices, and predicts environmental outcomes. It provides the quantified information and analytical capabilities required for making location-based decisions that increase economic efficiencies and reduce consumption and contamination. 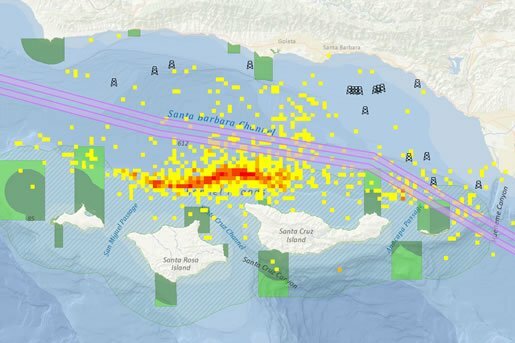 GIS can be used to reroute shipping lanes away from ecologically sensitive areas such as whale migration grounds. People’s stakes in our environment vary. GIS gives us a lens to understand different objectives and create an environment for collaboration. Among these objectives are economic potentials, equality, environmental and social justice, environmental preservation, land use, and more. Understanding these concerns requires data and analysis. Many countries have setup spatial data infrastructures (SDI) that enable data exchange via standards and interoperability. Organizations have created GIS portals that enable fast access to geodata and map services. GIS platforms serve as frameworks for multidisciplinary collaboration in designing sustainable practice policies, implementation, and administration. These technologies promote dialogue by helping different organizations articulate their concerns within the scope of sustainable planning. The environment is a global responsibility. Forests do not stop at a border; one ocean touches many coastlines; and climate change impacts every continent. The implementation of sustainable polices and administration must cross borders. The common language of geography expressed through the tools of GIS can bring people together, and thereby tip the balance toward a more sustainable planet.